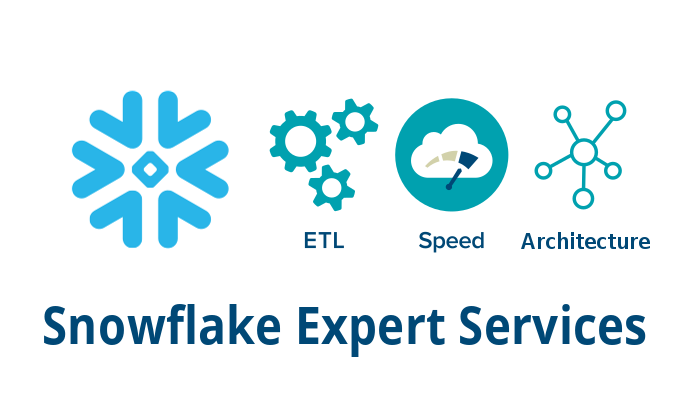 In this post we will explain the clever caching strategies Snowflake uses for performance optimization. In the process we will also cover related internals of Snowflake. A lot of information is from the official research paper created by the Snowflake authors which explains the architecture of Snowflake in depth. Snowflake strictly separates the storage layer from computing layer. The database storage layer (long-term data) resides on S3 in a proprietary format. This means you can store your data using Snowflake at a pretty reasonable price and without requiring any computing resources. The database compute layer (virtual warehouses), which has to be turned on for data loading, manipulation or querying, uses AWS EC2 instances to perform computation on your data. Each EC2 instance has a SSD disk along with RAM memory. 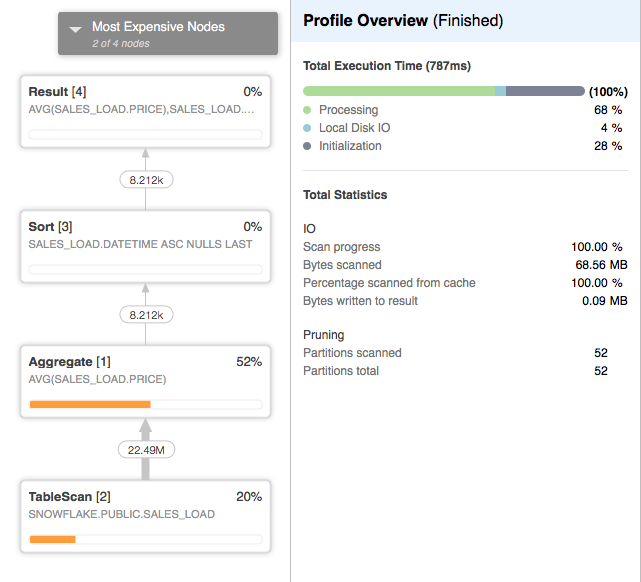 When the user runs a query on Snowflake, the data is read from the database storage layer (cold data) on S3 into the memory of EC2 instance where operations are performed. What is important is that the data which was retrieved then also gets cached into local SSD storage. Because Snowflake is a column oriented database, usually a limited number of columns will get retrieved from S3 and cached in the SSD disk. Also Snowflake might retrieve only some rows of the table if particular micro-partitions can be pruned. This in turn greatly improves the performance of future queries that might be ran on the same data because it can be loaded extremely quickly from a local SSD compared to loading from S3 through a fast network. When the virtual warehouse is shut down, cache on the local SSD is lost. S3 which is used for persistent storage of data. It can handle huge amounts of data but has a high latency. While the database files are stored on S3 it is not transparently accessible to the user. Usually a DBMS has a buffer pool with most recent pages it accessed stored in there (in RAM memory), but Snowflake doesn’t have a buffer pool. Instead it allocates memory for operations like join/group by/order/filter... The reasoning behind that is that if you scan large amounts of data you don’t need a buffer pool because your data will enter and exit the buffer pool very quickly. The local SSD rather acts like a buffer pool because the latest data (on a column level) that was used in queries is stored there for faster access. We will show you in a couple of examples how this works. We will use this dataset containing the records of all individual housing transactions in England and Wales since 1995. The dataset has around 22 millions rows which are stored on approximately 60 micro-partitions. After turning on our virtual warehouse, we will select the price, datetime and property type for all houses sold after 1st of January 2000. Because the virtual warehouse was just turned on, its local SSD cache will be empty. We expect that data will be fetched from S3, processed and then cached in local SSD storage. Only 3 columns will be fetched from S3 and all the rows from micro-partitions where the datetime column falls within this range. We can indeed see that 0% of the data was scanned from cache. 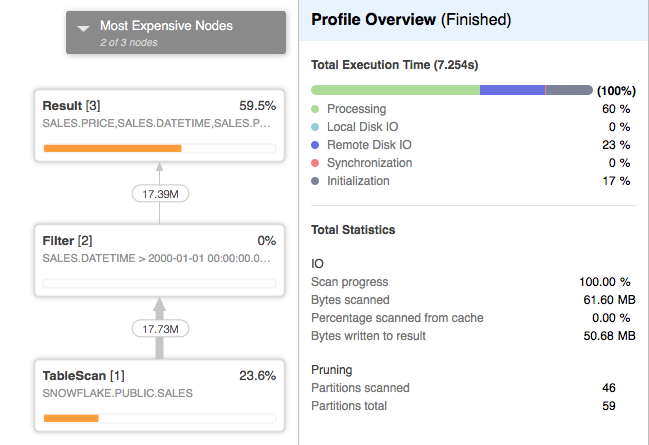 Also notice that 23% of the query cost was spent on Remote Disk IO. We expect that this query will be able to read all the data from local cache because the previous query fetched all of that data into the local SSD cache. We can observe that 100% of the data was scanned from the local SSD cache in this case. This greatly reduced the cost of scanning a table and the cost TableScan operator fell from 22% to 1%. Now we will create a new table from the same dataset of Housing Prices that we have on our stage and then immediately run a very simple query on top of it. 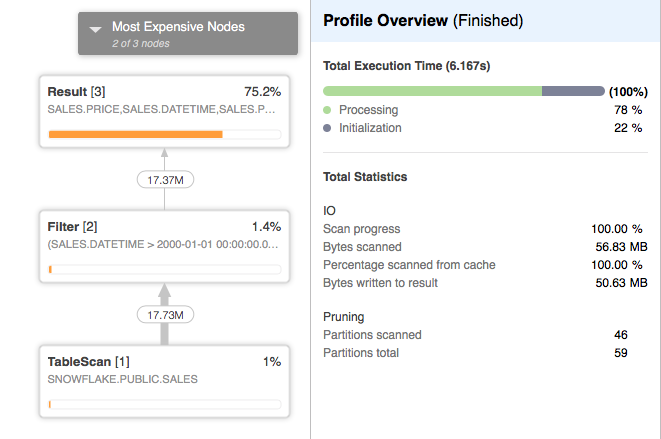 We can notice that this time all of the data was scanned from the local SSD cache. This can be explained with the fact that loading the data from the staging area into a database is done on the EC2 instance(s) of our virtual warehouse. 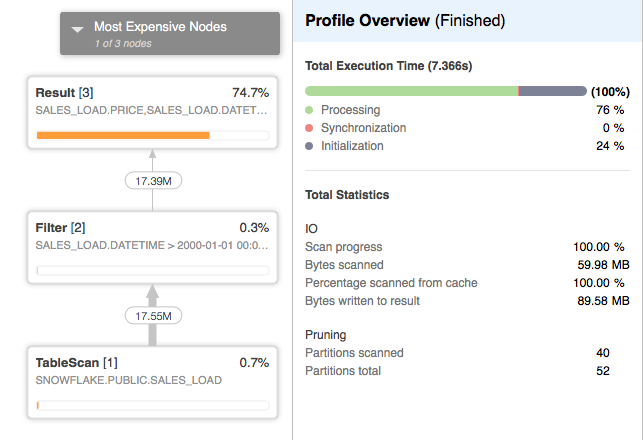 Because the loading is done on the EC2 instance, it would be very easy for Snowflake also to cache the data. Snowflake has another very useful feature and that is caching of result sets. Imagine executing a query that takes 10 minutes to complete. Now if you re-run the same query later in the day while the underlying data hasn’t changed, you are essentially doing again the same work and wasting resources. Instead Snowflake caches the results of every query you ran and when a new query is submitted, it checks previously executed queries and if a matching query exists and the results are still cached, it uses the cached result set instead of executing the query. This can greatly reduce query times because Snowflake retrieves the result directly from the cache. Typically the query and the result set are stored in the Metadata repository. But large result sets are stored on S3 storage and while we couldn’t find documentation how the storage is priced, we assume it’s the same model as normal database storage. Update: Craig Collier, a technical architect from Snowflake, explained in the comment section that Snowflake actually stores large result sets in a proprietary key/value store managed by the Snowflake service. 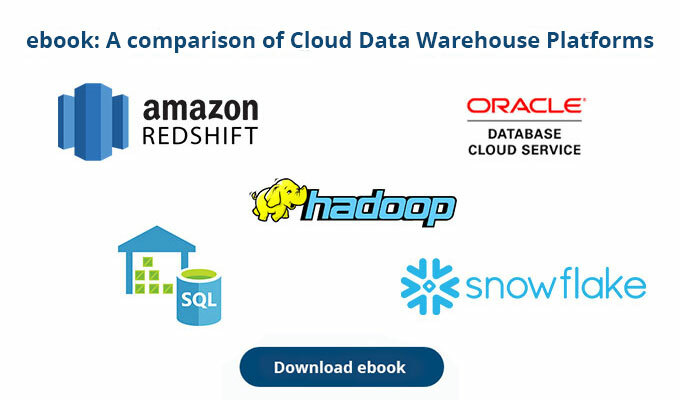 As the costs for data stored in Snowflake’s Cloud Services layer (Metadata repository) are currently not passed on to the customer this means that even large result sets are stored free of additional charge. Query result sets are by default stored for the next 24 hours. If you access the result set again in those 24 hours, it will extend the time period for 24 more hours. To showcase how result sets are cached, we will run a simple aggregation query on the sales_load table from the previous section. Now if we re-run the same query again we expect that Snowflake’s result caching will come into account and that the query won’t even be executed, rather the engine will only use the result set from the previous query. This shows how Snowflake saves us compute time by re-using the previous result set of our query instead of computing a new one. Unfortunately the caching of result sets is still somewhat primitive. Imagine that we wanted to run the same query but with a filter in the form of a HAVING clause. Technically the solution could be re-computer from the cached result set by applying a simple filter but Snowflake will instead query the data again.